Sure he crushes cities, irradiates the countryside and kills thousands, but could it be that Godzilla just wants to be understood? One denizen of the Internet, who goes by the name Samurai Frog, seems to think so and has created a Web site to prove it. Godzilla Haiku, online at godzillahaiku.tumblr.com, puts the thoughts of Godzilla and some of Japan's other giant, rubberized monsters into poetic form — haiku, to be exact. Haiku are 17-syllable poems of three lines, the first line comprised of five syllables, the second of seven and the third of five. They are among the easiest poems to write, and the hardest to write well. Traditional haiku often have a seasonal reference. But Godzilla isn't much for tradition. Skyscrapers or Shinto shrines, they're all the same to the King of the Monsters. They make the same crunch beneath his feet. 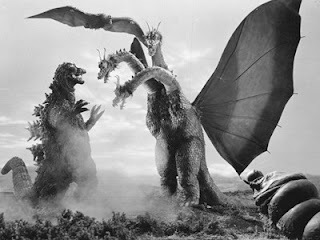 After he trampled Tokyo, menaced Mothra and roasted Rodan, who would've thought Godzilla had it in him. Is he a poet, only we didn't know it? Despite his grumpiness and propensity for violence and property damage, there has always been something sad, even soulful about Godzilla. In his closing narration in the U.S. version of "Godzilla: 1985," Raymond Burr's character, Steve Martin, sums it up best: "For now, Godzilla — that strangely innocent and tragic monster — has gone to earth. Whether he returns or not, or is never again seen by human eyes, the things he has taught us remain." Ever since his first movie stomped Japanese theaters on Nov. 3, 1954, Godzilla — or Gojira, as he is known in Japan — has been a symbol. He is the atomic bomb. He is a force of nature. He is punishment for "tampering in God's domain," which was a common occurrence in 1950s sci-fi movies. Strangely, as the years went on, Godzilla also became Japan's and Earth's protector, fighting other monsters, extraterrestrials intent on conquering the planet and time travelers bent on changing history. In 1991's "Godzilla vs. King Ghidorah," Godzilla saves Japan from time travelers from the year 2204, who have come back in time to stop Japan from becoming an economic power. At least I think that's the plot. I've seen the movie half a dozen times, and it never really makes sense. Godzilla prevailed, but then Japan went into a deep recession known as the "Lost Decade," which, as far as I know, had nothing to do with incoherent time-travel schemes. You win some, you lose some. Maybe all of that symbolism is too much to ask of anyone, even a 30-story-tall mutant dinosaur with radioactive breath. All he wants to do is step on model cars and toy trains, yet we expect so much more of him. Horror and fantasy writer Joe R. Lansdale explores Godzilla's ennui in a brilliant short story titled "Godzilla's Twelve-Step Program," found in Lansdale's latest collection, "The Best of Joe R. Lansdale." Filled with humor and pathos, the story charts Godzilla's progress, or lack thereof, as he tries to kick his habit of pulverizing cities and squishing people between his toes. Godzilla gets a regular-guy job at a foundry. He watches TV. Some days, things seem like they might be OK. Other days, Godzilla gets that all-too-familiar itch. If only people would just leave him alone. After all, all Godzilla wants is to appreciate the beauty of the world — and swat a few pesky airplanes from the sky. Once the backwater of the entertainment world, cable TV is now where the action is. But I can't help but think cable has lost something on its long journey toward respectability. When it comes time for Hollywood to hand out awards, shows like "Mad Men," "Breaking Bad" and "Dexter" — not to mention HBO's late, lamented "The Sopranos" — are always in the running for Emmys and Golden Globes. That's a big change from just 20 years ago, when cable shows weren't even eligible for Emmy nominations. Instead, cable had its own, separate award, the ACE. And winning one was no big deal. Flash forward in time, and many of the best shows on television are cable originals, from "Battlestar Galactica" and "Anthony Bourdain" to "Penn & Teller" and "The Venture Bros." Yet when I look back at old video clips on YouTube, I'm struck by what cable has given up. As creative as cable is now, it's a different kind of creativity than 30 years ago. Early cable depended on inventiveness born of desperation. And if one crazy idea failed, who cared? No one was watching, anyway. For instance, search YouTube and you'll find old footage from TBS back when it was still known as WTBS, Atlanta's "Superstation." 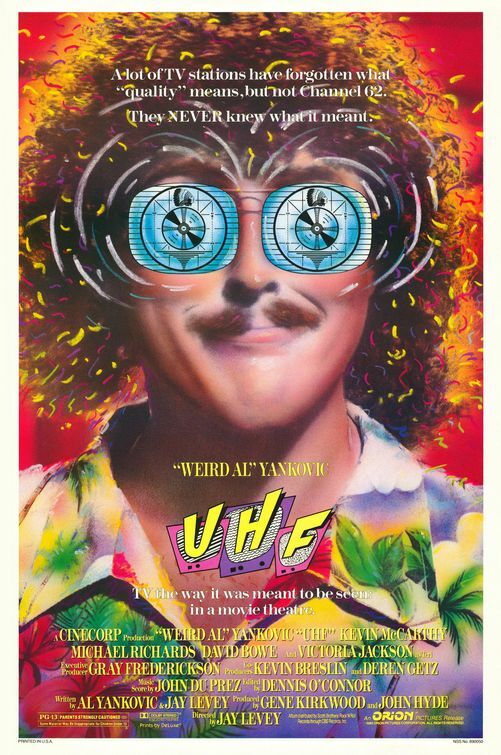 The early days of Ted Turner's flagship channel remind me a lot of the 1989 movie "UHF," in which a down-on-his-luck dreamer played by "Weird Al" Yankovic takes over a failing local TV station and programs it with whatever nutty shows he can imagine. 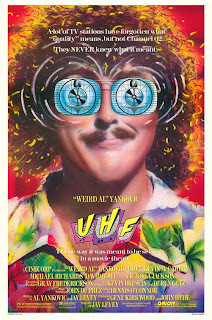 Yes, I just compared Ted Turner with "Weird Al." I bet you didn't see that coming. But it's no stretch, really. Before it went national, WTBS (originally WTCG) was just another struggling, independent UHF station trying to make a buck. In the early '80s, WTBS was awash with local Atlanta professional wrestling, 1940s Bugs Bunny cartoons and Three Stooges shorts, and whatever movies Turner could get his hands on. But Turner had in-house talent, too. Bill Tush had mostly worked behind the scenes before Turner made him the face of WTBS — doing commercials, hosting movies and, most importantly, anchoring a 3 a.m. news broadcast. Tush turned that news program into a screwball mix of news and comedy, and he did it some 20 years before Jon Stewart made Comedy Central's "The Daily Show" a hit with college students. Tush's newscast gained a cult following, and Turner gave him his own comedy/variety show, which lasted two years and helped give Jan Hooks ("Saturday Night Live") her start in showbiz. Afterward, Tush became CNN's go-to entertainment reporter, a position he held until 2003. The '80s were wild days for cable TV. WTBS invited in local schoolchildren to read and report the news for a weekday afternoon segment called "Kids Beat," and it aired "Starcade," a game show in which contestants played arcade games like "Donkey Kong" and "Pac-Man." TBS wasn't alone. Although it's now known for critical favorites like "Monk" and "Burn Notice," USA Network had similar beginnings. Its early lineup included wrestling, game shows and B-grade horror movies hosted by "retired superhero" Commander USA (aka Jim Hendricks). It was inexpensive, fly-by-the-seat-of-your-pants programming, and there was a kind of freedom to it that went beyond just being free of broadcast television's standards and practices. It was the sort of freedom that comes, to paraphrase the song, with having nothing to lose. Getting good science from a typical Hollywood movie is a bit like hearing hoof beats and looking up to see a zebra instead of a horse. It happens, but not nearly as often. To change that, the National Academy of Sciences founded the Science and Entertainment Exchange, which aims to improve the portrayal of science in movies and on television. But while some members of Hollywood's creative community have proved receptive, it looks like the scientists still have a lot of work to do. Exhibit A: "2012," directed by serial offender Roland Emmerich, whose credits also include "The Day After Tomorrow," "10,000 B.C.," "Godzilla" and "Independence Day." He also helmed the Mel Gibson vehicle "The Patriot," so history isn't his strong suit, either. The bad news is bad science doesn't stand in the way of box-office success. "Armageddon" grossed more than half a billion dollars worldwide despite relying on some of the worst science ever committed to film. From a scientific standpoint, "Armageddon" is like spending $140 million to remake "Plan 9 from Outer Space." The good news, however, is bad science doesn't always sell. Exhibit B: "The Core," a box-office disaster so egregious in its scientific illiteracy it makes "Armageddon" look like it was written by Stephen Hawking. Meanwhile, good science — or at least passable science — can make money. "District 9" made more than $200 million worldwide on a budget of $30 million. But while there is nothing preventing filmmakers from being more scientifically literate, there is no guaranteed payoff for scientific accuracy, either. Scientists can complain about scientific inaccuracies in movies, but audiences don't seem to care. And the reason audiences don't care is because they don't know much about science. A Harris Interactive poll last year found that only 53 percent of adults in the U.S. know how long it takes for the Earth to orbit the sun. And only 59 percent know that humans and dinosaurs did not live at the same time. A Gallup Poll last year found that only 39 percent of Americans believe in evolution. Given statistics like that, it's no wonder hardly anyone complains about the aliens in "Avatar," no matter how unlikely it is that a species would evolve hair that plugs into trees and animals, just like a USB cable plugs into a computer. By Hollywood standards, "Avatar" director James Cameron is usually careful with his science, but even he won't let science stand in the way of a metaphor. He has 2.6 billion reasons — and counting — not to care too much about the plausibility of USB hair. Besides, most scientists are giving the Na'vi a pass because they are Cameron's only real stretch of the imagination in "Avatar." Well, besides "unobtanium," that is. 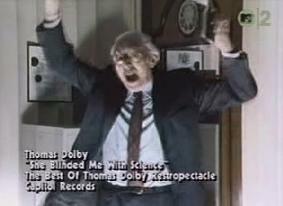 Emory University physicist Sidney Perkowitz, for example, has suggested a rule allowing every film just one major suspension of disbelief. Unfortunately, while the success of "Avatar" has every movie studio rushing to make 3-D movies, they don't seem as eager to follow Cameron's lead in getting the science right. Scientific illiteracy isn't confined to the United States. Michigan State researcher Jon Miller found that while only 28 percent of Americans qualify as scientifically literate, that's still slightly better than in Europe and Japan. So, while I wish the National Academy of Sciences well, I doubt it will make much headway in Hollywood until audiences, not just here but worldwide, demand more realistic science from their entertainment. Culture Shock 03.04.10: Is there gold in Golden Age comic books? Superman isn't letting a little thing like a recession keep him from going up, up and away. But can the rest of us take advantage? A copy of Action Comics No. 1 set a record last week when it sold for $1 million, the highest price any comic book has ever commanded, and a sizable sum even for the book that introduced Superman. But that record didn't stand long. Three days later, Batman proved he has what it takes to take down the Man of Steel. A copy of Detective Comics No. 27, the Caped Crusader's debut issue, sold at auction for $1,075,500. Both comics are in excellent condition, each rating an 8.0 out of 10 according to the Certified Guarantee Company. But the sale prices were staggering nonetheless. Before this year, no comic book had come close to the $1 million threshold. The top sale price I could find was $350,000 for a copy of Marvel Comics No. 1 purchased in 2001. So, is this the start of a bull market for old comic books? And, if so, does it reflect real value, or is it a bubble waiting to pop? The last time comics entered a boom period was the late 1980s and early '90s. And that boom continued even through the recession of 1990-91. That boom, however, turned out to be the perfect set-up for a disastrous crash. The official history of the period tells of speculators — mostly people who had never seriously read or collected comic books before — entering the market and driving up the prices of newly published books. That fueled the growth of upstart publishers looking to cash in on the increased demand. My own pet theory is that many of those speculators thought comic books were a safe haven in an otherwise sluggish economy. But whatever their motives, the speculators thought wrong. In 1993, while the rest of the economy was recovering, the comics bubble burst. During the next four years, many of the publishers that had helped fuel the boom — Broadway Comics, Tekno Comics, Eclipse and Valiant — went under. Retailers and many of their customers were left holding boxes filled with near worthless books, some of which had fetched hundreds of dollars during the boom's peak. But if history is repeating itself, it's not following the same script. The '90s comics bubble was limited to newly published comics with large print runs. When demand dropped, there were simply too many comics in circulation for prices not to fall to near nothing. This time around, we're looking at two books published in the late 1930s, the beginning of comics' "Golden Age." Publishers can't flood the market with 70-year-old comics. Another difference this time is comics have not run counter to the rest of the economy. According to Nostomania.com, virtually all of the top 100 most valuable comics have lost value during the past year. Two of the few exceptions, Showcase No. 22 (first appearance of the second Green Lantern) and Tales of Suspense No. 39 (debut of Iron Man), can be explained by Hollywood hype. A Green Lantern movie is in the works, and the Iron Man sequel hits theaters this spring. Ultimately, the record sale prices of Action Comics No. 1 and Detective Comics No. 27 could be meaningless anomalies. Or they could drive speculation that might extend to other vintage comics and end up crashing down in a few years. Or, just maybe, all of this is a real reflection of the enduring value of old comic books. But for now, I wouldn't bet a copy of Amazing Fantasy No. 15 on any of those possibilities if I were you.